Harare — The late Hugh Ramapolo Masekela — Bra Hugh to his devotees and Oliver 'Tuku' Mtukudzi were more than musical buddies. Their Shona duet “Tapera” is a classical example of a collaboration of legendary portions. And in 2015, Bra Hugh appeared on stage without prior warning to show goers. What followed was a performance reserved only for superstars. The South African legend sang the Shona lines with ease, showcasing his embedded talents. Bra Hugh had Zimbabwean roots. He was born in South Africa but his great grandfather came from Masvingo. Their original surname was Munyepawu and their ancestors were Karangas that migrated to South Africa. 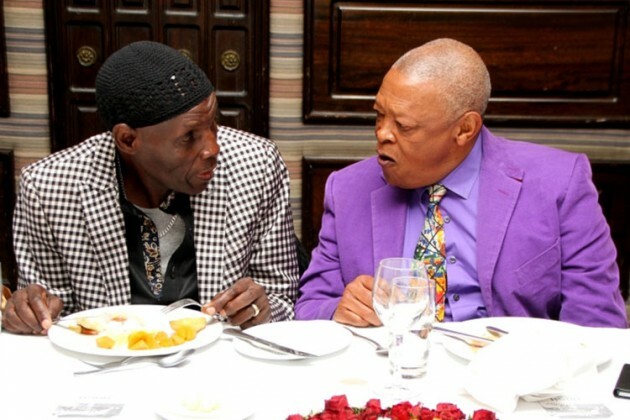 The two died a year apart — Bra Hugh on 23 January, 2018 and Tuku exactly a year later. “In the 1980s I came here with a friend and I have also come to support a friend at such a big show. It is an exciting experience,” he said. According the Herald, he actually refused to pose for pictures with women that had artificial hair. He said it was a sign that they hated who they were. He said he wanted Africans to be proud of who they are and their heritage. “I do not like women with fake hair. If they want to have photos with me they should go and remove that fake hair first. It shows that they are not proud of their roots. “They want to look like other people. Why not look like a real African woman?” That night, Bra Hugh proudly spoke about his Zimbabwean roots. The legend also talked about his passion to groom young musicians and instill a sense of pride in them. It was a vision he shared with Mtukudzi who has done a lot of grooming through his Pakare Paye Arts Centre. Masekela was born in KwaGuqa Township, Witbank, South Africa to Thomas Selena Masekela, who was a health inspector and sculptor and his wife, Pauline Bowers Masekela, a social worker. As a child, he began singing and playing piano and was largely raised by his grandmother, who ran an illegal bar for miners. At the age of 14, after seeing the film Young Man with a Horn (in which Kirk Douglas plays a character modelled on American jazz cornetist Bix Beiderbecke), Masekela took up playing the trumpet. His first trumpet was bought for him from a local music store by Archbishop Trevor Huddleston, the anti-apartheid chaplain at St. Peter's Secondary School now known as St. Martin's School (Rosettenville).